Attacking “the ugly tide of corruption” in Nigeria’s government, a Catholic bishop has highlighted the tough challenges the country’s new administration will face after the election. 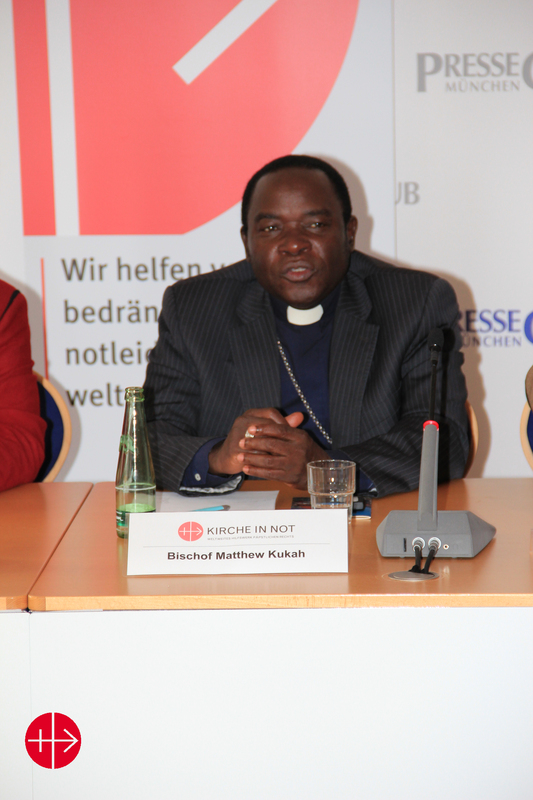 According to Bishop Kukah major inequalities have resulted from the wealth from Nigeria’s natural resources being concentrated in the hands of a few. “Despite the huge resources that the nation has received from the unprecedented sales in oil, there is hardly anything to show for it in the lives of ordinary citizens. The uncontrollable hemorrhaging of resources has led to the ubiquity of misery among the people.” He called on the election’s winners to channel resources into education, job creation and agriculture. “This is based on the ugly experiences that have been associated with some of the worst form of violence in Nigeria,” said the bishop describing how Christians had started sending their families to their ancestral homes and states even before the Christmas. But the prelate was largely positive about the elections, which are currently scheduled for Saturday, March 28. “Nigerians,” he said “are approaching the forthcoming elections with measured optimism, excitement but a deep sense of caution and even trepidation.” Saying that the result was “too close to call,” Bishop Kukah paid tribute to efforts to repel Boko Haram’s recent incursion further south ahead of polling day. 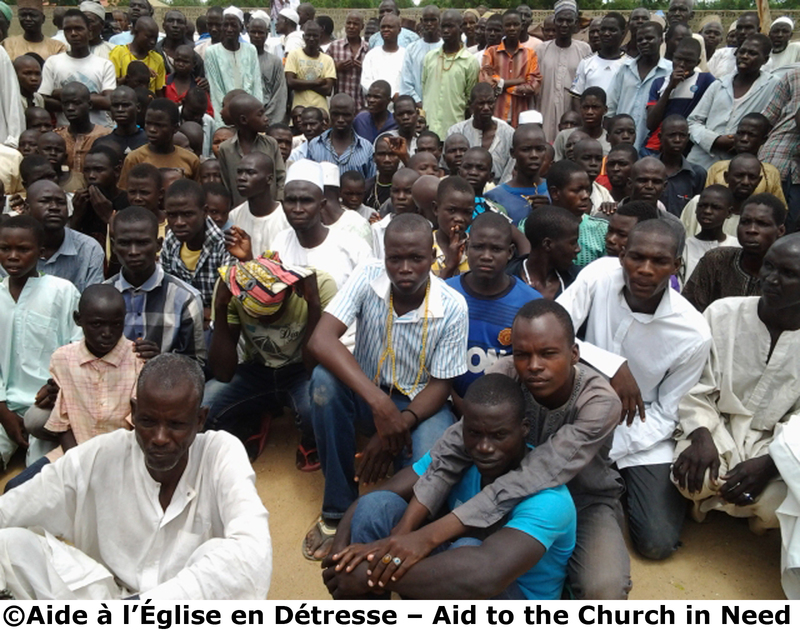 ACN has provided $64,220 in emergency aid to the displaced people of the Maiduguri diocese who fled the advance of Boko Haram. 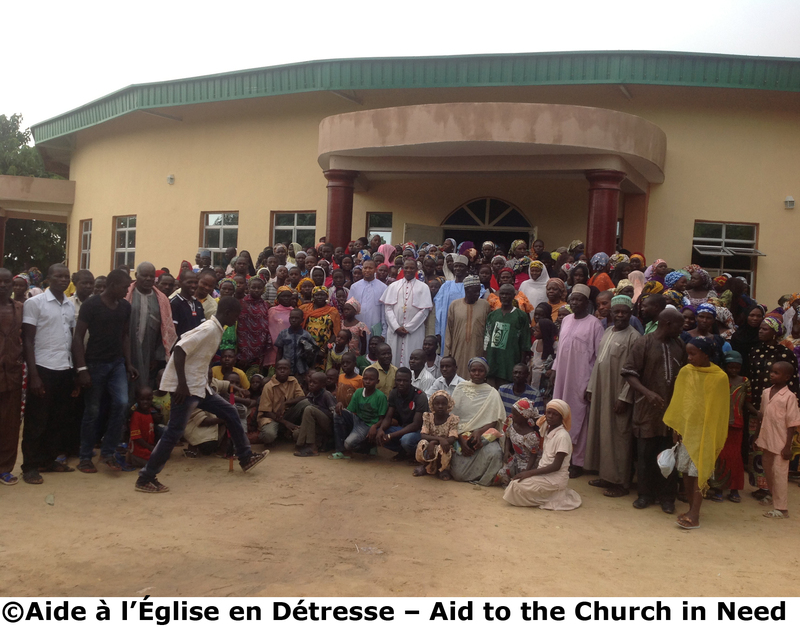 The charity also provided $52,800 in Mass Offerings to priests in the diocese, half of whom found refuge in the neighbouring Yola diocese. Montreal, Friday February 6, 2015 – On 14 February 2015 Nigeria will be voting for a new president and a new parliament. The April 2011 elections in Nigeria “were heralded as among the fairest in Nigeria’s history, but they were also among the bloodiest,” according to Corinne Dufka, senior West Africa researcher at Human Rights Watch. 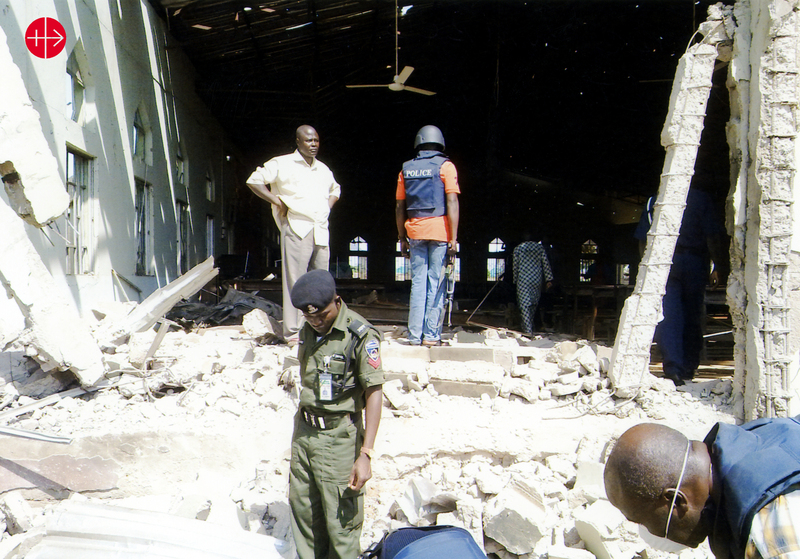 Across 12 northern states – more than 800 people were killed in 3 days of rioting and 65,000 people were displaced. The imminent election is also overshadowed by the terror campaign of the Islamist organization Boko Haram, which wants to destabilize the country. The Call to Prayer will start one week before elections, on Saturday 7th February and will be held throughout the week, to raise awareness and encourage people to pray for Nigeria and for the peace in this country. Each day we will offer different prayers. In Twitter and Facebook you can follow the action using the hashtag #2015NigeriaPrayer. The islamist terror group Boko Haram wants to massacre all the Christians in Níger. So writes a missionary Sister in a dramatic e-mail message from the country. As a result of the violence, this Sister was forced to flee, along with the rest of her congregation, and they are now living in hiding with a family in the capital Niamey. In her e-mail she describes the terrible violence in the capital and in the town of Zinder, the second largest city in Niger. To protect her safety, we are not revealing her name. Between them the Sisters did all they could in the little time they had. In the midst of the drama there was one Sister in the community who was from Rwanda – and who knew what it meant to flee, having been through the cruel genocide in Rwanda in 1994. She put on all the clothes she could find. “She had on five skirts and five blouses, one on top of the other. We were in fits of laughter when she came out of her room, like a giant; she could scarcely walk, she had so many clothes on! One of the other missionaries had only just returned from Poland and had not even had time to unpack her things, but we had to flee immediately. 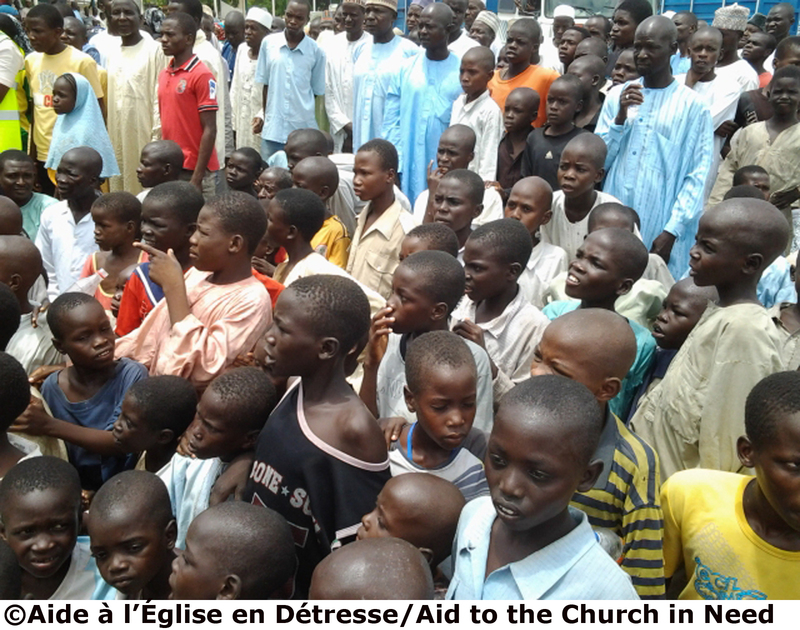 Montreal/London – Monday January 19, 2014 – A Bishop whose diocese in north-east Nigeria has suffered most at the hands of Boko Haram wants the West to send in military forces to defeat the militants. Describing how a strategically superior Boko Haram was now recruiting from countries across north-Africa, Bishop Oliver Dashe Doeme of Maiduguri said that Western military intervention was the only viable option in the fight against the militants, now allied to Islamic State. In an interview with Aid to the Church in Need (ACN), the Catholic charity for persecuted and other suffering Christians, the bishop said Nigeria’s military was weakened by incompetence, corruption and Boko Haram infiltration within its ranks. He warned that drastic action was urgently needed as the attacks earlier this month in strategically significant Baga showed that Boko Haram was poised to become a threat well beyond Nigeria’s borders and was recruiting from Niger, Chad, Cameroon and Libya. 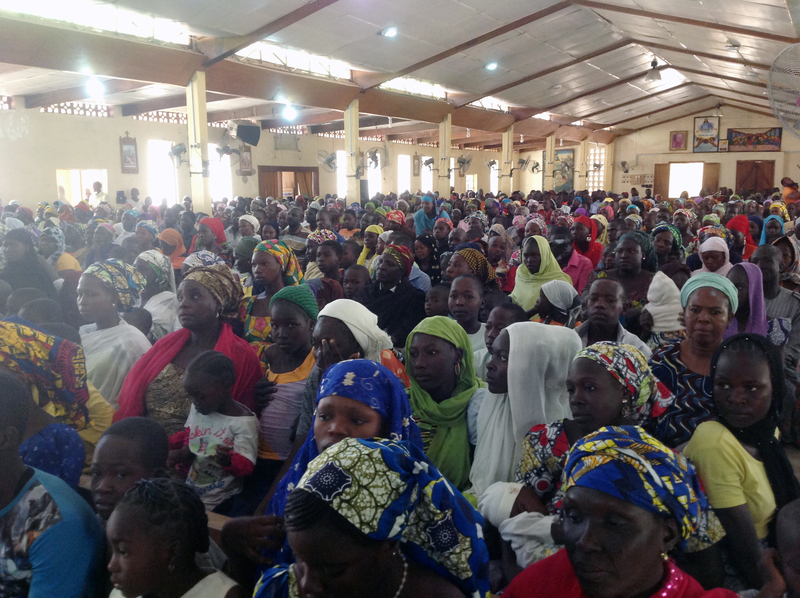 The bishop also called for the arrest of clandestine foreign backers of the Islamist terror group, adding: “The [Nigerian] government knows who are sponsoring Boko Haram.” And describing how within five years, the Boko Haram threat has decimated his diocese with more than 50 churches and chapels destroyed and more than 200 churches abandoned. He said 1,000 of his faithful have been killed, many of them by Islamists. “The [extremists], point a gun or a knife at them saying that if they do not convert they will be killed. Some of them have been killed for refusing to convert,” said Bishop Dashe Doeme. Describing how since 2009, nearly 70,000 of the 125,000 Catholics in Maiduguri had fled their homes, he appealed for help for faithful taking refuge in displacement camps. The bishop thanked ACN for providing $62,672 CAN in emergency aid for displaced people from his diocese. 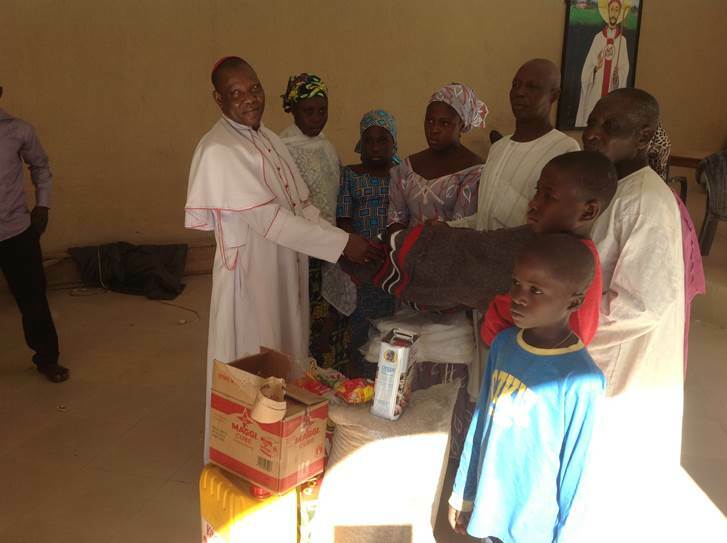 The charity has also given $50,870 CAN in Mass Offerings for the priests of Maiduguri diocese, half of whom have taken refuge in the neighbouring diocese of Yola in eastern Nigeria. 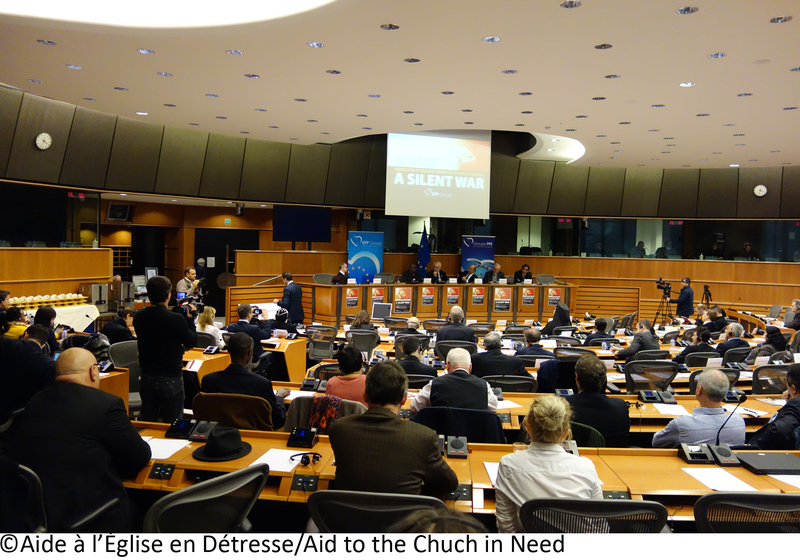 Montreakl/Brussels/Königstein, 17 December 2014 – Aid to the Church in Need’s (ACN) Worldwide Religious Freedom Report 2014 was presented on Thursday 11th December at the European Parliament in Brussels. 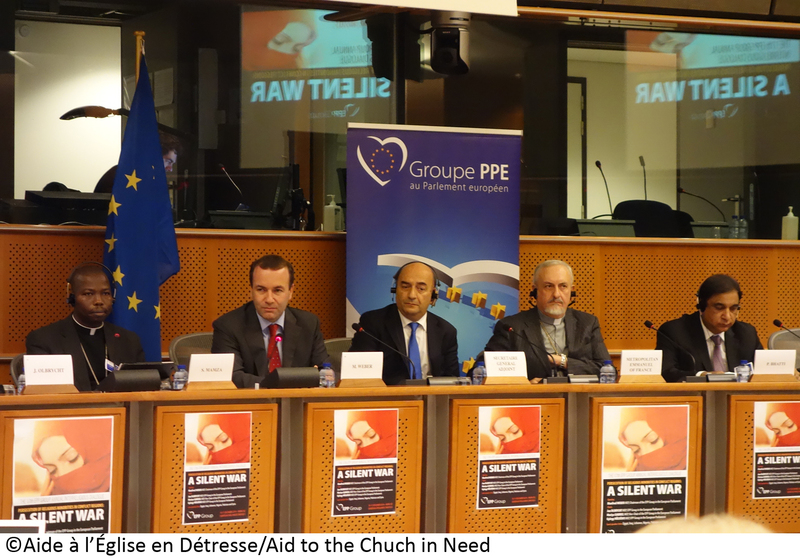 Speaking to an audience of 110 invited MEP’s and NGO representatives, the report’s Chairman of the Editorial Committee, Peter Sefton-Williams, invited the European policy-makers “to call on religious leaders to speak together against religiously inspired violence”. In addition to presenting the key-note speech for this 2-day seminar hosted by the European People’s Party, ACN supported the event with the participation of four witnesses Bishop Steven Mamza of Nigeria (Yola Diocese), Sister Hanan Yousef of Lebanon, Mrs. Dina Raouf Khalil of Egypt and Dr. Paul Bhatti of Pakistan who each related their own experiences of persecution, or care of those who suffer persecution or discrimination at the hands of others. Nigeria’s Bishop Mamza, who feeds 60,000 refugees in his diocese and gives shelter to 10,000 in Church buildings as a consequence of the terrorist aggression said, “Boko Haram is only looking for power, they say it is like ancient Islam but even local imams say Islam has never been such a heartless religion”. Pakistan’s Dr. Paul Bhatti added, “The Taliban inspires the hate speech of many imams in Pakistan, Afghanistan and India and the lack of education makes it difficult to protect the young from this kind of fundamentalism”. The speakers highlighted that religious persecution is generating unprecedented waves of migration and displacement, often affecting the most vulnerable – women and children. Sister Hanan Youssef of the Good Shepherd Sisters working with Iraqi and Syrian refugees in the poor quarters of Beirut, said that in 2014 her small dispensary alone had served 18.000 patients. Illness such as polio long eradicated from Lebanon, have returned with the refugees and that the majority of the 120 new patients she treats everyday have no means with which to pay for the medication having been stripped of every possession in their flight. Mrs. Dina Raouf Khalil, coordinating the development of 35 schools with 12.000 students in the poorer regions of Upper Egypt, explained that in many ways Egypt had been spared the tragedy presently tearing apart the fabric of societies in neighboring countries. As she explained, although Egypt clearly faces a number of challenges there are small signs of hope such as “a young population that is beginning to renew an educational interest in the arts, which is also indicative of a move away from violence”. 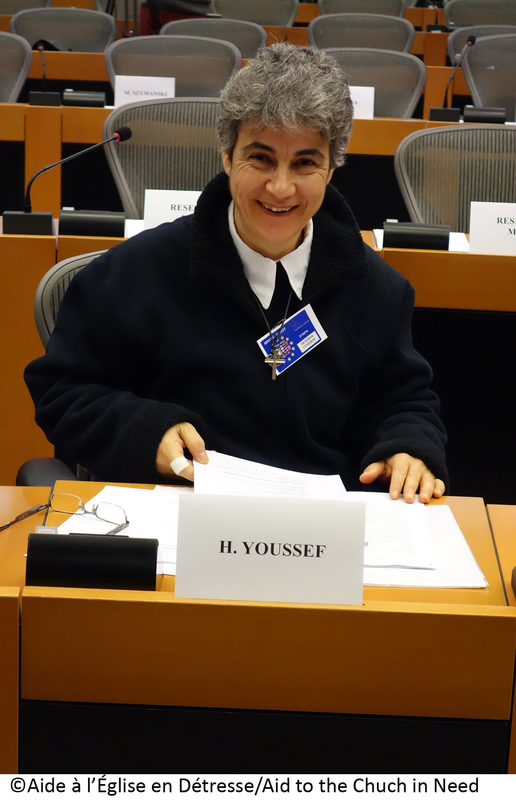 As summarized by the Members of the European Parliament chairing the panels, there is no time to loose to stop the advance of religious extremism and that strong words from governments must be accompanied by actions that support the persecuted minorities worldwide. So too, here in the West, action must be taken to address a growing concern regarding the level of religious illiteracy and the fertile ground this creates for radicalization as reflected by the number of young Europeans and Americans joining the jihadists. Among the proposals, Father Patrick Daly Secretary General of the Bishops’ Conferences of Europe to the European Union, suggested that public and private education should work to increase the religious literacy of young Europeans: historically accurate and factual information about religion and beliefs and their role in society’s cultural, historical and artistic development. 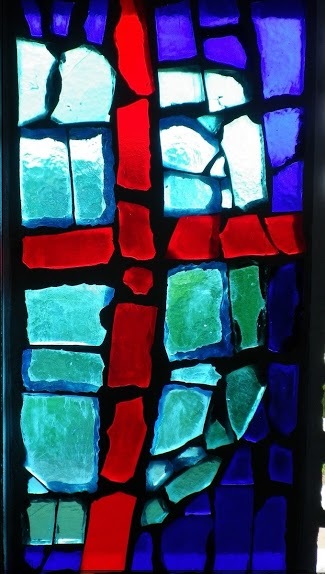 “Churches and religious communities are ready to cooperate in this important task to help people understand the cultural background and the religious environment that surrounds us”. No less, officers in public services and diplomatic and external services should be trained in religious affairs to better understand the social fabric in the areas of their expertise. Boko Haram emerged as a terrorist group in 2009. In the last few months we have seen the aggressive devastation of the Boko Haram activities. Many of our people are forced out of their ancestral homes. Right now, thousands are living in mountain caves; the few who were able to escape have been taken in by friends and relatives in Maiduguri and Yola. Thousands have managed to escape to Cameroon and are living in very difficult conditions lacking food, shelter and medication. Parents stood by watching their children grow weak and die. A good number of our youth are forcefully conscripted, while the elderly, women and children are converted to Islam. A lot of Nigerians are trapped and are forced to practice strict Sharia law in communities like: Bama, Gwoza, Madagali, Gulak, Shuwa, Michika Uba up on till Mubi. These are the towns on the Federal road linking Maiduguri and Yola in Adamawa state. All of these captured towns by our estimation are no longer part of the Nigerian entity because no one can go in, but those who would luckily escape have got stories to tell. The terrorists have declared all the captured towns as Islamic Caliphate. The people trapped are forced to accept and practice the strict doctrines the militants are out to propagate. Mubi is predominantly a Christian community and the second largest commercial nerve in Adamawa state after Yola. It forms a district in the Diocese of Maiduguri and has two strong parish centers: St. Andrew’s Catholic Church and Holy Trinity. It also has two great Chaplaincies: Federal Polytechnic and Adamawa State University. Wednesday October 29th was a sad day in the whole diocese. The Boko Haram insurgents over ran the town making over 50,000 inhabitants flee. A good number fled to Cameroon and were trapped for days: Including five priests and two sisters. With the fall of Mubi; of the six districts, three have been captured and occupied by the terrorists. What a life!! We are keeping to the Church’s teachings on the witness of presence. We have over 100,000 Catholics displaced and some who were trapped are still finding their way out to safe towns. 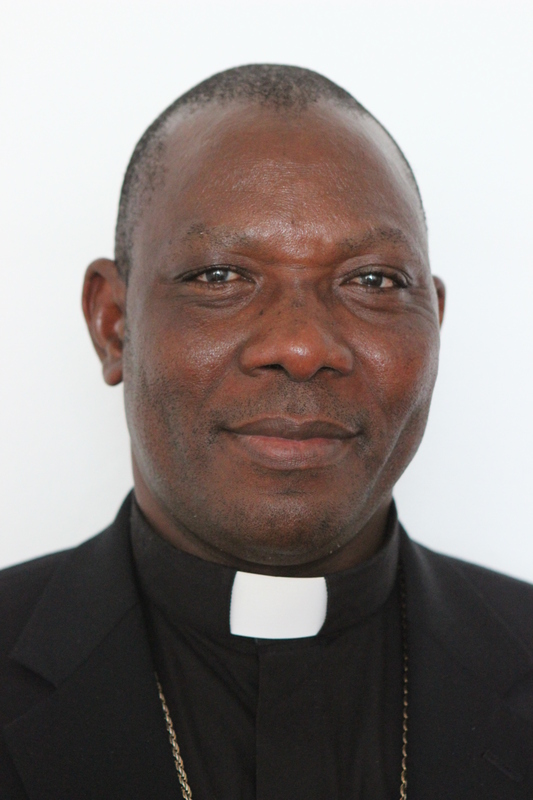 For now the diocese is saddled with the responsibility of caring for the Internally Displaced persons. This she does across board not minding religious confessions, because we look at our common humanity. 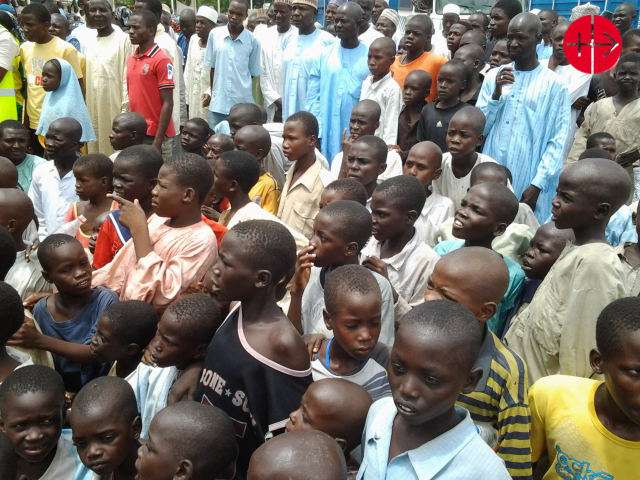 We have more than seven camps in Maiduguri and other displaced brethren are with their relations and friends. 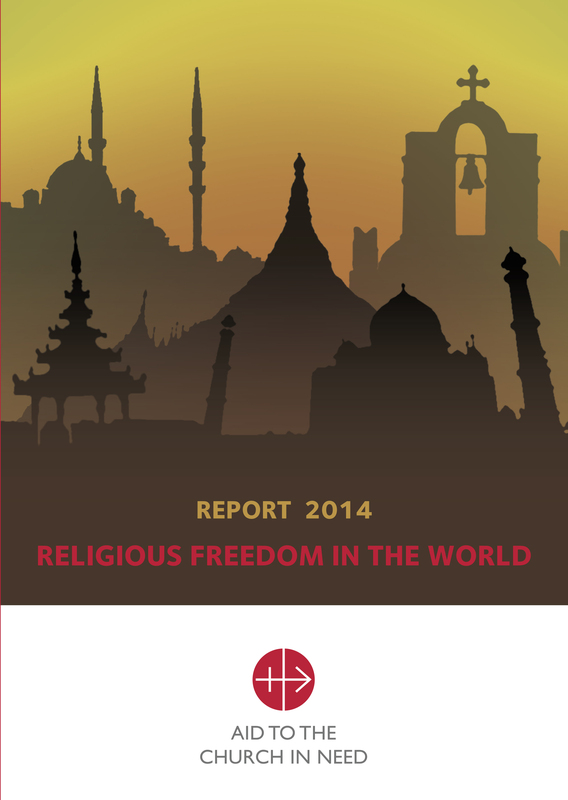 of Persons killed: Over 2,500 Catholic Faithful have been killed. Displaced persons: Over 100,000 Catholic faithful are displaced. 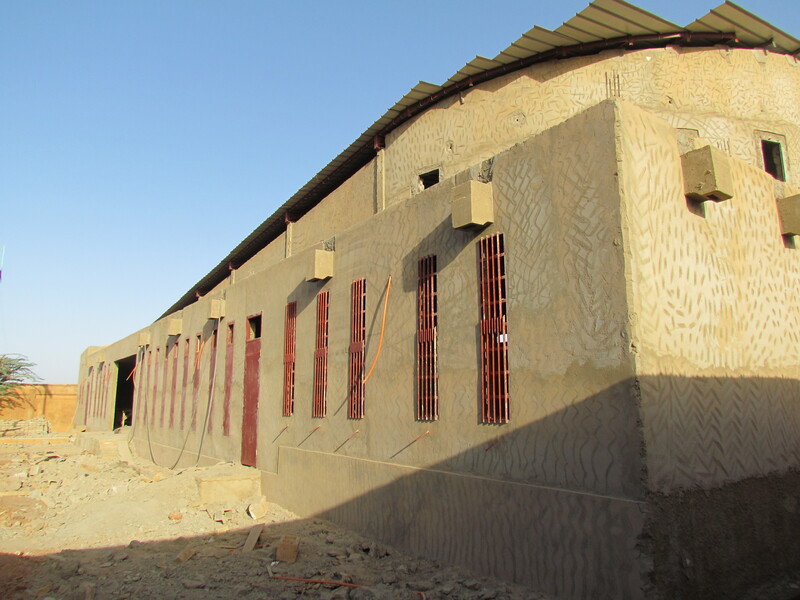 Most schools in the Northeast cannot reconvene regular activities not only because of the terrorists, but also because such school premises now serve as refugee camps. Displaced Priests: Out of the (46) priests currently working in the diocese (26) are displaced. Many of such Priests are accommodated by Bishop Dami Mamza of Yola Diocese. Displaced Catechists: Over (200) Catechists are displaced. Displaced Rev. Sisters: Over (20) Rev. Sisters are displaced. Abducted women and girls: Over (200). 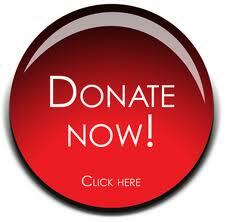 Forceful conversion to Islam: A good number of our faithful have been converted to Islam against their will. Deserted convents: Out of the (5) convents, (4) have been deserted. Churches destroyed: Over (50) churches and rectories have been razed down, a good number were destroyed more than once. Deserted Churches/Chaplaincies: Out of the (40) parish centers / chaplaincies (22) are presently deserted and occupied by the terrorists. Affected Schools: The diocese has over (40) primary and secondary schools, over (30) have been deserted. Compensation: The diocese has not seen any compensation for the destructions of lives and properties from 2006 and 2009 to date. 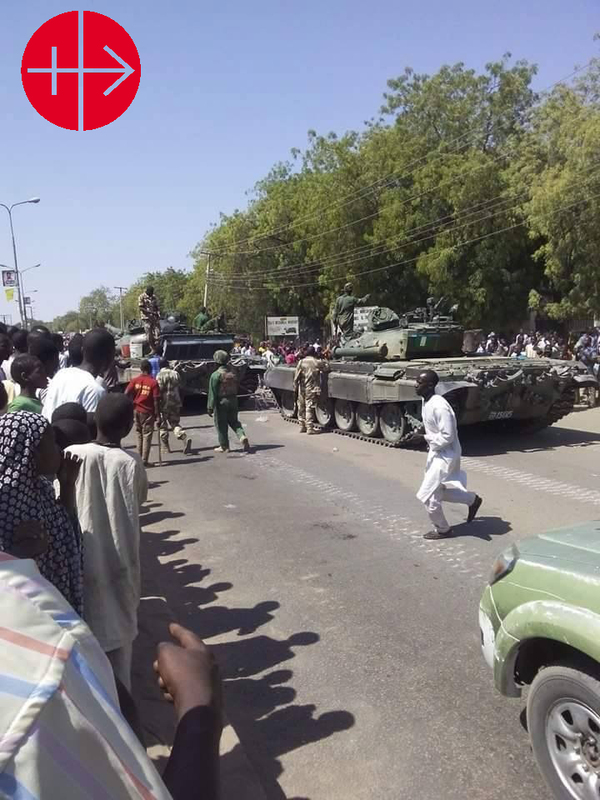 Borno State has been captured and occupied by Boko Haram, Gomboru Ngalla and Bama, Gwoza, Maffa and Abadam. Askira Uba, Dikwa, and Marte. Other towns include: Pulka, Banki etc. Maiduguri is completely surrounded by the terrorists. The one exit out of Maiduguri city is only the Maiduguri-Damaturu road. The same is true for areas of Adamawa State and Yobe State. These towns are under strict control by the terrorists and no well meaning Nigerian can trespass.